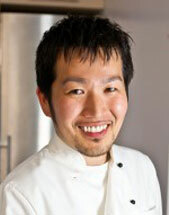 Marc Matsumoto is one half of the Fresh Tastes food blog team. A culinary consultant and recipe repairman, Marc shares his passion for good food through his website norecipes.com. For Marc, food is a life long journey of exploration, discovery and experimentation and he shares his escapades through his blog in the hopes that he inspires others to find their own culinary adventures. Marc’s been featured in the New York Times, Wall Street Journal, and USA Today, and has made multiple appearances on NPR and the Food Network. Follow on Facebook, Twitter, or Google+.